This is one really special burger and you never saw anything similar before! 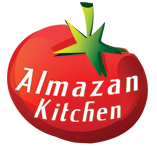 It is cooked on fire in the wild forest and the ingredients that we combine are really special, with a notch of AlmazanKitchen in Serbian style! Try it out! Simple and awesome! Enjoy! Take organic chicken legs, remove the bones. Salt & pepper it. Marble together homemade kajmak and soft cheese along with a homemade paprika. Cook the chicken legs until golden brown. Cut in half homemade buns, warm it on coals then cover with homemade pavlaka. Chop handful of forest spring onions, place it on pavlaka. It’s time for the homemade cheese we made in step No. 3. Chicken leg goes to its lawful place. Pour it with sauce left in the pan. Cover with top half of the bun. This is my first time visiting your website and man its clean and simple. Thumbs up!